This is one of my favorite recipes to make whenever we have canned peaches in the house. 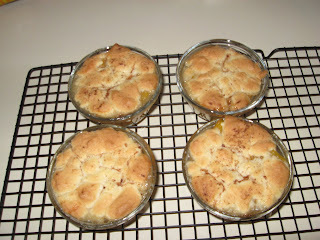 I combine it with canned apple pie filling, fridge sugar cookie dough and it makes the yummiest cobbler ever! Preheat oven to 350 degrees. Take out an 8×8 inch casserole dish. Mix drained peaches, apple pie filling, and cinnamon inside of the dish. Take the reserved syrup and mix with corn starch. Pour over the top of the peach mixture. Break sugar cookie dough over the top of the mixture in small dollops (like dumplings). Sprinkle top of cookie dough with cinnamon, if desired. Bake about 30 to 40 minutes or until the inside is bubbly and top is golden brown. Crockpot instructions: Combine ingredients in the same way you would for the oven, except you won’t put the cookie dough on top of the cobbler. Set slow cooker on low for 4 hours or high for 2 hours. 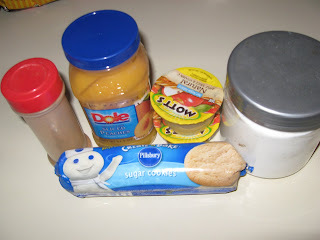 Top cobbler with pieces or dollops of the cookie dough, sprinkle with cinnamon, and cover slow cooker….BUT! You need to vent it a little. I use a chopstick like Stephanie over at A Year of crockpotting does with her desserts with pastry toppings. Let it continue to cook for 1 more hour or until the top is light brown and crisp.